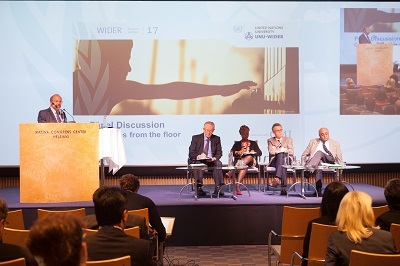 The 17th WIDER Annual Lecture was held on 19 September at Europaea Hall, Marina Congress Centre, Helsinki. The lecture was delivered by President and Nobel Laureate Martti Ahtisaari who explored the role egalitarian principles can play in conflict resolution, peacebuilding and development. The international community has succeeded in ending violent conflict and bringing a measure of peace to a large number of nations. Yet today conflicts still rage in many parts of the world and societal tensions are tangible and even increasing in many countries. The forces of democratization are strong, but so too are those pulling nations back to instability and conflict. Development in all its forms can contribute to strengthening the prospects for peace. A large part of this must be the reduction of inequality. Citizens have to be fully included in the building process of an egalitarian society. President Ahtisaari, drew on his wide and continuing experience through the Crisis Management Initiative, the United Nations, and bilateral diplomacy to reflect upon a fundamental question: how can conflict resolution, development progress and egalitarian principles be brought into closer harmony for the benefit of all? The lecture was followed by further discussion of the topic by Mr Ahtisaari, a panel of three leading development experts, and the audience. The programme also included the screening of an exclusive interview with Economist and Nobel Laureate Amartya Sen.
Mr Ahtisaari’s activities post-presidency have included facilitating the peace process between the Government of Indonesia and the Free Aceh Movement, chairing an independent panel on the security and safety of UN personnel in Iraq, appointments as the UN Special Envoy for the Horn of Africa and Personal Envoy of the OSCE CiO for Central Asia, and Special Envoy of the Secretary-General of the United Nations for the future status process for Kosovo. 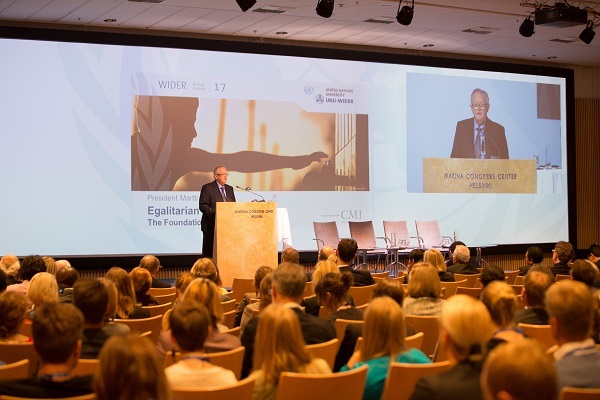 President Ahtisaari is active in numerous non-governmental and non-profit organisations. In December 2008, Mr Ahtisaari was awarded the Nobel Peace Prize. View the WIDER Annual Lecture on Egalitarian Principles. Selection of images from the WIDER Annual Lecture 17. President and Nobel Laureate Martti Ahtisaari who explored the role egalitarian principles can play in conflict resolution, peace building and development.The address was followed by a panel discussion. Watch here.